The modern city of Berlin finds its humble origins when the Germans arrive in the Margravate of Brandenburg in the middle of the 10th century. They settle on two islands in a relatively high point in the swampy Spree river valley. Throughout early history, the area known as Berlin contained small fishing and farming villages populated by Slavic, Saxon, Wend, and Ascanian peoples. The first written mention of Berlin occurred in 1244. Along with its sister city, Cölln, located on the opposite bank of the river Spree, the settlement grew to the area grew to about 8,000 inhabitants in 1400. The three settlements, Berlin, Cölln, and Friedrichswerder merged to become one of the most important trading cities in central Europe. Berlin in the middle ages is punctuated by rapid growth, taxes, the plague, the reformation, and the thirty-year’ war. Very little is left of this ancient settlement. A tour of Medieval Berlin is a walk through a part of Berlin that is often neglected and no longer exists. 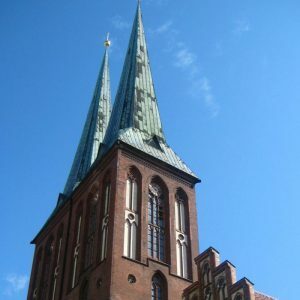 Medieval Berlin begins in the Nikolai Quarter, where Berlin was born at the feet of the Nikolai Church, originally a late Romanesque basilica, erected about 1230. The area around the church with its medieval alleys was preserved throughout the centuries, until the air raids and the Battle of Berlin destroyed it during World War II. The heart of medieval Berlin is really the Mölkenmarkt and the Mühlendamm (Mills Dam), a place where the river could be easily crossed.